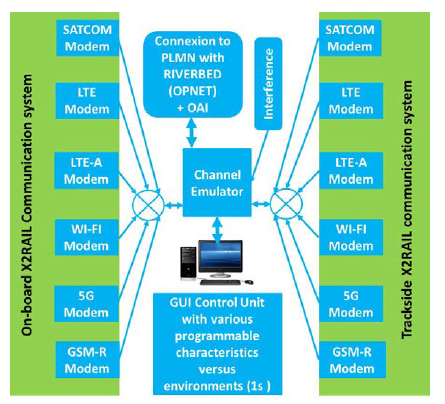 provide an innovative platform for tests and validation of various radio access technologies (Wi-Fi, GSM-R, LTE, LTE-A, 5G and Satellites) that combines simulations of the communication core network and emulation of various radio access technologies thanks to the coupling of discrete event simulator such as RIVERBED Modeler (former OPNET Modeler), Open Air Interface (OAI), various radio channel emulators, Network emulator based on OAI, models of IP parameters and real physical systems. The radio access emulation tool will offer a graphical based Interface for the users. combine very new approaches for testing, so called System in the loop (SITL) and Hardware in the loop (HITL) in order to be able to connect directly and to couple the real radio access equipment, the radio emulators (physical systems) and the simulators able to mimic the railway network and the railway channels behaviour. 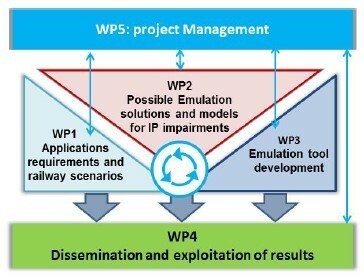 platform will work at IP level i.e. the Radio access emulator will reproduce the radio access behaviour as seen by the applications. investigate the various communication and environment scenarios in railways covering degraded modes, outages, network overload scenarios, interferences and other perturbations which occur in the railway environment or can be expected in the future. Particular focus will be proposed on interferences, taking into account intentional ones. 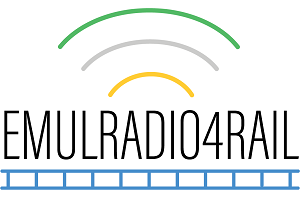 EMULRADIO4RAIL will analyse and select the communications characteristics perceivable by the applications and services using the communication bearer (like throughput, packet loss, jitter, etc.). assess the communication capabilities of existing radio access networks and how they could be emulated. provide the support to S2R members for integration of the EMULRADIO4RAIL platform in the verification labs. EMULRADIO4RAIL is driven by a consortium composed of the main research and development actors in wireless telecommunications for rail involved in current and recent state of the art projects concerning radio channel sounding and channel models development, radio channel emulation, IP parameters models, network simulation with Riverbed discrete event simulator including System In The Loop (SITL), Hardware In The Loop (HITL) and Open Air Interface.